RHYS: The temperature here dropped into the thirties last night, making me think about soup recipes. One of the few things I like about cold weather is sitting by a fire with a bowl of homemade soup. And this one will surprise you. I grew up hating parsnips. My family would put them around the Sunday roast. Yuck. But I was staying with a friend when she served this delicious soup. What is it? I asked. When she said parsnip I nearly fell through the floor. I make it every winter and it is beyond yummy. So I'm happy to share my friend's recipe with you now. CURRIED PARSNIP SOUP, AS COOKED BY MY FRIEND PENNY FOUNTAIN. to garnish cream or sour cream and chives. heat butter and oil, add parsnips, garlic and onion. Fry . Stir in flour, curry powder. Puree. Swirl in cream and sprinkle chives on top. It's also good if you sprinkle shredded parmesan cheese on top. If you serve this nobody will ever guess that it's parsnips. It tastes so rich. Oh, this does sound delicious; thanks for the recipe. There's nothing quite like a good bowl of soup and some warm bread, especially on a rainy or cold day. One of our favorite soup recipes is a corn chowder recipe that Julia shared a while back. Split pea soup is another easy family favorite: one package of split peas, a meaty ham bone, two chopped carrots, two diced onions, four diced potatoes, garlic, pepper . . . add enough water to cover. Cook over low heat until the peas are soft. Put the soup through a food mill; return to the pot. Correct the seasoning, if needed, and continue cooking until soup is thickened. I used to think I hated parsnips, too. They have a nasty chemical taste. If they're the main ingredient. I have a friend whose family makes a dish with orange squash and parsnips (more squash) and it's delicious. Oh yes, this sounds yummy and perfect for fall--going to try! Thanks for the recipe, Rhys. I'm always looking for new soups to add to my winter repertoire. Parsnips are delicious cut into sticks and roasted with a drizzle of olive oil, and they're less starchy than french fries. They get a lovely sweetness when caramelized. Really, Karen? Do you peel them first? Do parsnips have..skin? what do you call the stuff on the outside? Do you peel the peel? Hmm..
Rhys, I love parsnips! Making this! Sounds yummy! And I've been craving a soup recipe. This will be on the menu this week. thanks, Rhys! Perfect timing, Rhys, as I was debating which soup to make today. Thought it was going to be butternut squash, but as I LOVE parsnips, I'll give this one a try. Temps in the 30s at night? I wish . . . we seem to still have summer here in Solana Beach. I had parsnips for the first time in Scotland a couple of years ago. They were roasted with some other veggies and set on a platter to eat with our salmon. Delicious! I'll try out your soup too, Rhys! When it gets cold here, which it hasn't yet, we tend to make chili to warm us up. Hank, if you peel carrots, then peel parsnips. They're essentially the same kind of root vegetable. I personally do not peel them, because of the nutrients in the outer part of the plant, but to each her own. So.. you peel the peel? 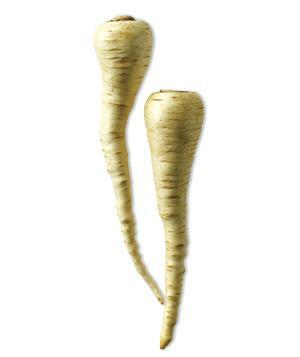 Can't say I'm a fan of parsnips, but if somebody served me something with them, I'd try it. I've gone a different direction this weekend. My husband has been home and the granddaughters spent the night last night, so I fixed a hearty meal last night of rump roast, potatoes, and carrots. Then, tonight I made a stew out of what was left of that plus adding vegetables of yellow corn, white corn, lima beans (I know some of you won't like that) and mushrooms. About a half of can of the corn and limas and a small jar of the mushrooms. I don't fix beef much these days, but it, especially the stew tonight, was a real comfort meal.